Drone. The word sends shivers down many a spine in the humanitarian world. Yet despite their reputation, these ‘unmanned aerial vehicles’ (UAVs) are increasingly being used to save lives. For Médecins Sans Frontières/Doctors Without Borders (MSF), drones have been game-changers. Creating informative maps enhanced by geographic information system (GIS) technology, these devices have a multitude of uses - whether it’s to plan the layout of a large camp, identify the location of boreholes in a cholera outbreak, or track a vaccination as it’s being rolled out. In Nsanje district, southern Malawi, our team recently used a small drone to conduct an aerial mapping exercise of Makhanga - a 60 square km area, which was partially cut off from aid during extensive flooding back in 2015. Few detailed maps of Makhanga existed, and our emergency teams wanted to be prepared in anticipation of the upcoming rainy season. To start, a pre-programmed drone (weighing 700g) was launched from various improvised airstrips - including a local football field - and directed to fly below cloud cover while taking multiple photos. As a result, it created a unique mosaic of photographs from its time in the air. These were layered and compiled to produce an ‘orthophoto’ - where the image is geometrically corrected to give it a uniform scale. This was then integrated with geo-referencing software to create a comprehensive map of the area, to be used in future responses. The MSF geographic information system (GIS) team review photos taken by their drone during mapping day. “While Google Maps are increasingly powerful, we still work in very remote or highly political areas which often remain completely unmapped," says Amaury Gregoire, MSF head of mission in Malawi. "In an emergency, requesting satellite imagery often takes too long, costs too much, or offers only very rigid insights. “Drones offer a highly complementary solution. Understanding airspace regulations for launching drones in different areas is critical - although as a new technology, regulations are often still being developed. In Nsanje, our team sought official authorisation from the District Commissioner to fly over the entire district, while alerting the closest air police to the impending launch. Locally, they enlisted the village chiefs and police who assisted with identifying suitable fields. GIS manager Raphael Brechard, who coordinated the Makhanga mapping, is one of two GIS staff working for MSF in Malawi and Mozambique. 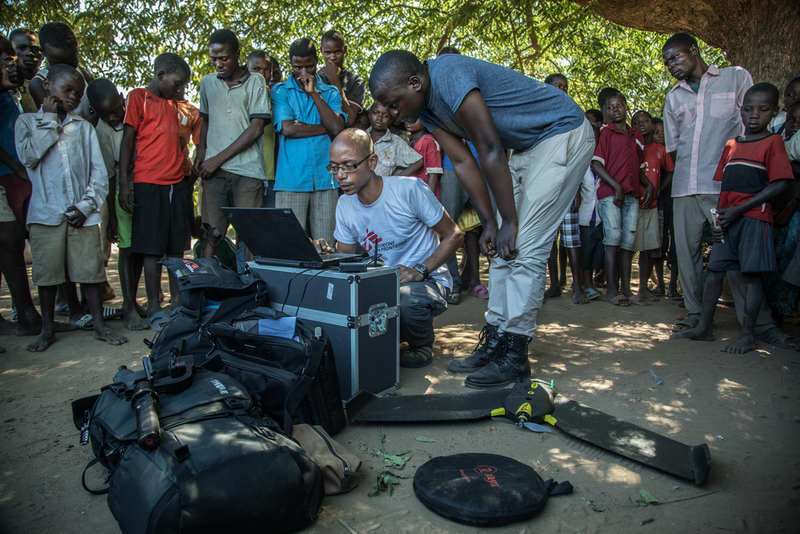 Raphael Brechard, MSF GIS manager, explains the drone's flight plan to the local community in Makhanga island, Malawi. “We’ve had a really positive experience with using drones in creating low-cost, innovative GIS solutions for complex problems, and we’re excited by future prospects,” he says. “Drone pictures could also help with digital elevation models or 3D video to explore the evolution of an emergency, like an earthquake or flooding. "We could even imagine using imagery to create virtual reality apps to remotely support people in emergencies when human access is impossible.